SILICON VILLAGE: Leaders of Government, Media, Fashion Advertising and Entertainment Unite to Declare Bengaluru "MUSIC CITY"
Leaders of Government, Media, Fashion Advertising and Entertainment Unite to Declare Bengaluru "MUSIC CITY"
Rishi Shah, Publisher & CEO Crossbones Media Pvt Ltd, along with Advisory Board Members Dr. J. Alexander, Dr. R.C. 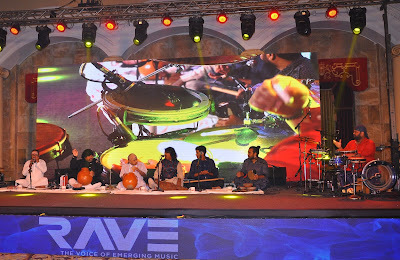 Sinha, Padmashree Vikku Vinayakram hosted an exclusive showcase at the ITC Windsor Manor, to launch RAVE 2.0. The launch happened over music, cocktails & dinner and was attended by music aficionados, advertising agencies and brand managers. Bengaluru witnessed the beginning of a new chapter in Hip Hop, Rap and classical music. Grammy Award winner & Carnatic music legend Padmashree Vikku Vinayakram, legend L. Subramaniam, percussionist Selva Ganesh, singers Kavita Krishnamoorthy & Kailash Kher, along with Rishi Shah, pledged their support to make Bengaluru the music capital of India. Padmashree Vikku Vinayakram opened the session by doing what he is best at: playing Ghatam along with his troupe. His son Selva Ganesh played his signature drum set wherein he plays it with his fingers as against conventional drumsticks. Selva’s son and Vinayakram’s grandson, Swami who is also a percussionist played his part and Selva’s brother Umashankar played the Ghatam too. Emerging music is the cornerstone of music industry and in India, its importance can be gauged from the sheer fact that we have multiple genres in 30 odd languages. Ironically, how India goes about discovering and developing new artists is by no means straightforward. Singer Kailash Kher is on record that way back in early 2003, it was Rishi Shah who spotted him and promoted him at a time when others had given up on him. Rishi Shah – who is part of the international music fraternity and member of the Multicultural Motion Pictures Association of America (MMPA) – has been spearheading the cause of emerging music and protection of artists’ rights. He was also inducted on the Executive Board of American Society of Young Musicians (ASYM) along with executive board members Quincy Jones, Paramount Pictures president of music and soundtracks Randy Spendlove and Dionne Warwick. * RAVE Events: Promote and discover emerging talent. Present the emerging talent in a newer and smarter way, and wherever possible, align them with our living legends in classical music. * RAVE DIGITAL STUDIO: RAVE will provide a digital mastering of any song, compliant with Apple Music, Spotify, SAAVN, GAANA, etc. for Rs 999 within 24 hours. We will create HD music video for Rs 4,999, again within 24 hours. We have a library of over 38,000 loops and samples. * RAVE RIGHTS: Musicians don't realize that if you just register your music, you will start earning royalties from your music. RAVE will help any artist register their music, publishing and sound recordings, for just Rs 9,999. Once they are registered, they will earn 100% of their royalties (as against the platform earning it). Concluded Rishi Shah: “There is amazing raw talent in India’s blocks which we refuse to categorize it the way government and planners have called it. Talent from places such as Dharavi (Mumbai), Nochikuppam (Chennai), Rajendra Nagar (Bengaluru), Indiramma Nagar Hyderabad etc are potential blocks for emerging talent. Besides, today we have launched ‘15 seconds to Fame’ wherein anybody can send us his / her 15 seconds of video recording of Rap or Hip-Hop and we will select five best rappers weekly basis and provide mastering of video for free.